Grand as they are, it’s easy to overlook giant sequoias, even for those who visit the Sierra Nevada range often. Tahoe skiers and Yosemite climbers don’t even pass close to the biggest clusters of the world’s largest trees in Sequoia National Park. At least once in a while, they should. 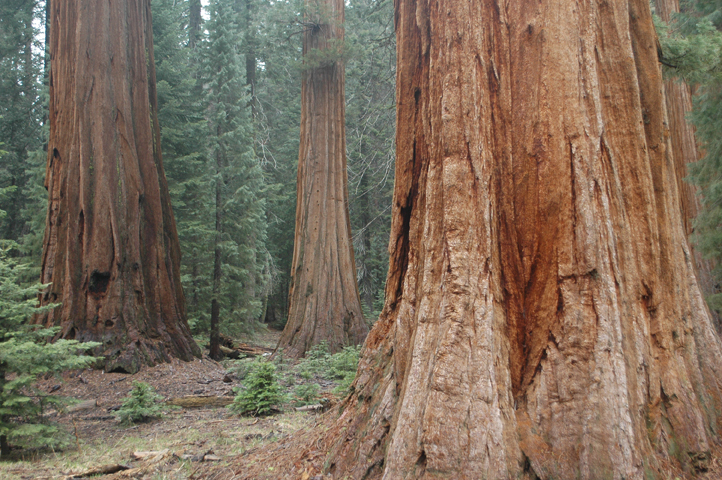 Giant sequoias rate among the world’s tallest, oldest and prettiest living things. A misty walk amongst the reddish-brown majesties refreshes the soul. The uplifting experience is well worth a detour from the more heavily-traveled mountain highways. Sequoia National Park boasts the world’s greatest concentration of the namesake trees, which grow naturally only in 75 groves between 5,000 and 7,000 feet of elevation on the western slope of the Sierra Nevada mountains. Accessible only by long and winding roads (Highway 180 from Fresno or Highway 198 from Visalia), the park gets just a fraction of the visitation of its popular northern neighbors, Lake Tahoe and Yosemite. That’s another good reason to take a road less traveled and enjoy these marvelously scenic and easy day hikes. Big Trees Trail takes visitors on a short and unforgettable loop through the Giant Forest, the park’s densest cluster of more than 8,000 giant sequoias. This entire trail is either paved or covered with a boardwalk, making it accessible to almost anyone, including those in wheelchairs. The loop circles the lovely Round Meadow and a portion of Little Deer Creek, taking hikers right beside giant trees around the meadow’s edge. The loop itself is .8 miles long, but most visitors (except those with disabled parking placards) will need to park at the Giant Forest Museum and hike from there, increasing the total distance to about 1.3 miles. General Sherman Tree, 275 feet in height, boasts the greatest size of any tree in the world and also attracts more visitors than any other in the park. The 2,200-year-old marvel named for the Civil War general deserves a visit, but don’t stop there just .4 miles from the parking lot amidst a horde of tourists. Instead, take the three-mile Congress Trail which starts nearby but delves deeper in the forest, immediately separates hikers from the Sherman crowd and introduces dozens of other giant trees. Regardless of your political leanings or feelings concerning the trail’s namesake institution, cast a vote of confidence for the House group. Don’t filibuster the Senate group, nor veto the executive branch’s emissaries, President Tree and sequoias named for Washington, Lincoln, Adams and Franklin. This paved loop hike has mild climbs and descents. The total distance from the main Sherman lot is 3.8 miles. More beautiful sequoias, Tharp’s Log and a delightful chorus of frogs are chief attractions of this area. Hikers can go out and back or make an easy loop of around two miles. To get there, drive east from Generals Highway past Moro Rock and then Tunnel Tree, through which cars can pass. Lumberjacks cut into this sequoia after it fell across the road’s path, so motorists can drive under it without the guilt associated with other tunnel trees killed by axe-wielding vandals to charge tolls and create photo opportunities. On the short drive, be sure to appreciate many clusters of giant sequoias, like Parker Group. Many trees elsewhere were named for leaders who never visited the park, and one even honors the Confederacy’s General Robert Lee, so it’s nice to see a few dedicated to those who protected the sequoias like Captain James Parker. Crescent Meadow itself features a picnic area beside a parking lot and nearby stream. From here hikers can trek to the interesting Tharp’s Log, a fallen sequoia that rancher Hale Tharp made into a cozy cabin in the 1860s. Near to his abode is Chimney Tree, hollowed by fire in 1914 but still standing more than a century later; giant sequoias can survive hundreds of fires in their long lifespans. There are many options to customize an outing here of two to four miles. Ambitious hikers should not let the short length of these hikes turn them away from such rewarding outings. If you want a greater challenge, do them all in a day! Along the way, you’ll spot different worthy walks that will likely inspire you to keep exploring. Other short hikes include Little Baldy, Moro Rock, Bobcat Point and Tokopah Falls. Most visitors can reach each scenic vista and return in one to two hours. In summer months, spelunkers of all abilities can explore Crystal Cave. Guided tour prices range from $5 for young children on the 45-minute family tour to $135 for adventurous adults on the six-hour wild cave tour. Tickets are available online and at the Lodgepole and Foothills visitor centers, not at the cave. For the truly motivated, the High Sierra trail runs from Sequoia’s western to eastern sides over 49 rugged miles. The park’s eastern side features jagged summits like Mt. Whitney, the tallest peak in the lower 48 states, and amazing backpacking on routes like the popular John Muir Trail. Most visitors to this region enter from and exit to the Eastern Sierra, enjoying outstanding experiences yet never seeing the awesome trees which gave the park its name. Outdoors lovers of all kinds won’t regret going west to see those trees at least once.